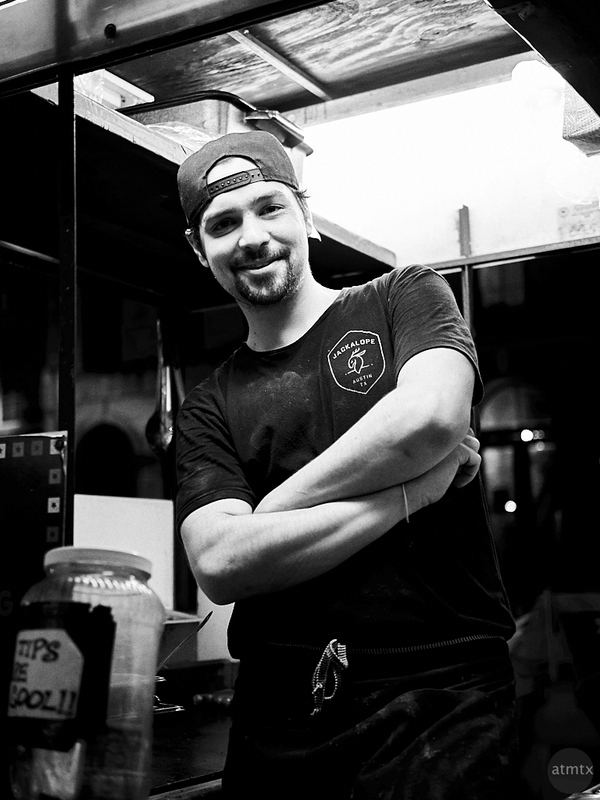 On the grungy sidewalks of 6th Street, food stalls entice late night drinkers. Along with the pizza by the slice walk-up windows, it’s a fast and easy way to get food. They’re not ubiquitous like the Hawker Centers in Asia, but their numbers have grown over the years. Jimmy was manning one of these tiny cooking booths, last Friday, the first night of SXSW 2017. His booth is called the Jackalope, which pairs with a nearby restaurant, with the same name. No doubt an easily accessible sidewalk extension. I shot this with the same camera and lens as the first two SXSW ’17 portraits, but I created this black and white in a different way. While I used the PEN-F’s in-camera black and white mode to create the previous portraits of Isabella, and Taylor and Shannon, for Jimmy, I did a black and white conversion from the RAW file. The black and white JPEG was over exposed for my taste, really caused by an error on my part, forgetting that the camera’s exposure compensation set to +1. The RAW allowed me to recover the highlights and make a more satisfactory monochrome. That’s one of the downsides of the in-camera black and white JPEGs, there’s not much latitude for post processing. Years ago, I struggled to create a satisfactory monochromes on my computer — the kind with high contrast and lots of blacks. I’ve gotten better over the years. It still looks different from the out-of-camera PEN-F, but I think it’s in the same ballpark. Day three of the SXSW Portrait series. Yeah, it happens once in a while.